The Anhinga is well recognized for posing on branches with its wings extended, supposedly drying in the sun. This bird is about 35" tall with a very long, slender neck. To feed, it swims underwater after fish and stabs them with its pointed bill. Known also as the "snake bird" because of its skinny, twisting neck and profile in the water, it is easily confused with the Double-crested Cormorant found in the same waters. 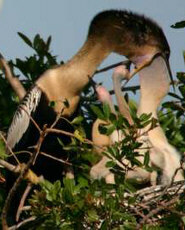 The pictures above show a female Anhinga feeding her chick. To feed, the chick's head must enter the female's throat. The chick prompts the female for food by grabbing the female's bill with its own bill and continually tugging (great white egrets are pictured in the background). Above, Anhingas are perched with wings spread. This act is thought to dry the wings after being in the water. Anhingas swim underwater after fish. They do not have the oily waterproof coating on their feathers that protects other birds from the elements. The bird on the left is a male and the two birds on the right are female. They are identified by the black or brown head and neck. Male and female celebrate the passing of a twig for the nest. 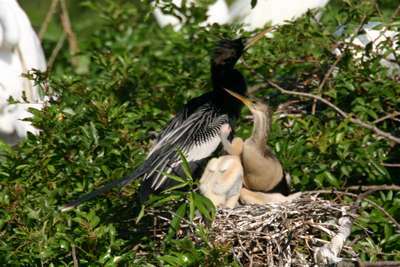 Female Anhinga and tan chicks. Anhinga family portrait - female, male and chicks on nest. Portrait of female anhinga. The eyes of nesting pairs (male and female) seem iridescent or neon-like.